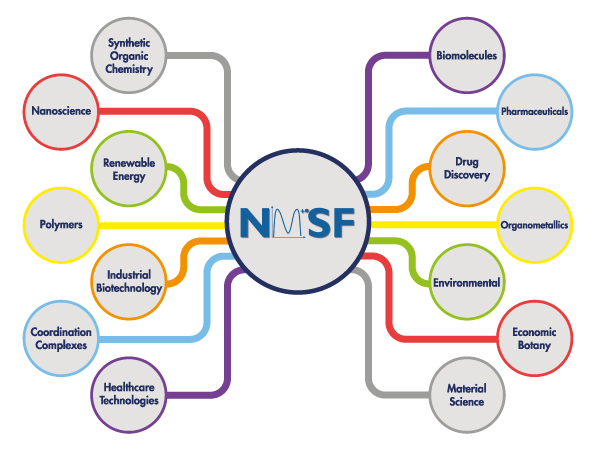 The NMSF has several mass spectrometers within three laboratories and the team here has a wealth of experience in analysing the widest variety of chemical compounds. All our main techniques ((n)ESI/EI/CI/ASAP(APCI)/*MALDI) will be charged the same price per analysis (see table below) and include accurate mass measurement as appropriate [*with the exception of MALDI as accurate mass measurement is a completely separate analysis to the initial characterisation and therefore an analysis charge will apply]. This means you can choose “Let Mass Spectrometry decide” in our online LIMS, Remote Analyzer (RA), when submitting samples in the first instance without worrying about financial implications as we can continue to allow analyses, or samples, to be interchanged between techniques. Multiple modes within the same technique e.g. positive and negative analyses will each incur a charge, and hyphenated techniques (GC/MS and LC/MS) and other more complex problem solving/contract research will be charged per hour basis. We will advise if any further analyses are required after the primary analysis and obtain your written agreement before commencing. 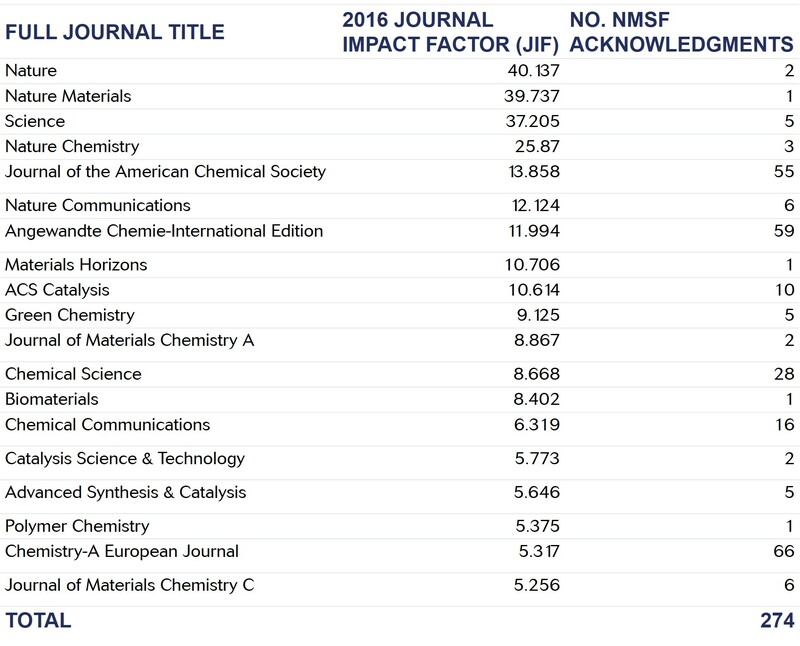 The table above highlights the number of NMSF supported publications between 2013-2018 published in journals with impact factors (JIF) greater than 5. In total, NMSF has supported 885 peer-reviewed papers in that period. Our team can help you analyse complex mixtures with high mass accuracy using gas chromatography (GC-MS) and high-performance liquid chromatography (LC-MS) coupled to high-resolution mass spectrometers. *Analyses can be done VAT-free if the appropriate VAT exemption certificate is provided, and please note that you will be invoiced once a sample batch is completed. *A £50 minimum charge is applicable per batch. We can offer a 10% discount per analysis on sample batches of 20 or more per month, per group. Additionally, we offer alternative arrangements for large numbers of electrospray samples, "Fasttrack" (there is potential for a similar MALDI service – please enquire). This has been run successfully with various groups and departmental services over the last 9 years and is charged per microtiter plate well; multiple polarities require individual wells. Raw data obtained from samples submitted in microtiter plates can be returned for your group to process; your group will need to obtain the required software, however NMSF staff will be able to provide training for processing data either in Swansea or at your institute as part of our Outreach activities. We also engage in Training, Education and Consultancy activities. We aim to be as fair and helpful as always, please contact us to discuss your specific circumstances and obtain relevant quotations. We are in a highly competitive market and we realise you have a choice for your mass spectrometry requirements – we look forward to our partnership with you. 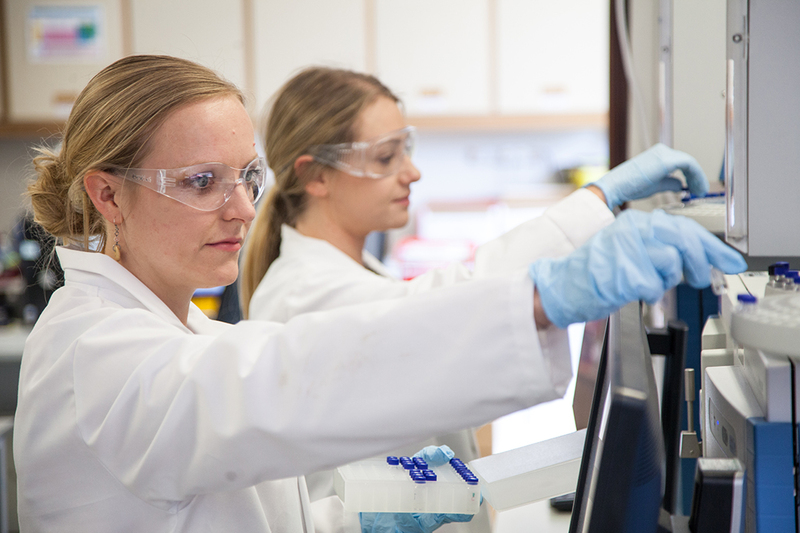 A multinational company has been working with Swansea University to identify extractable contaminates in deep well microplates from a range of manufacturers. 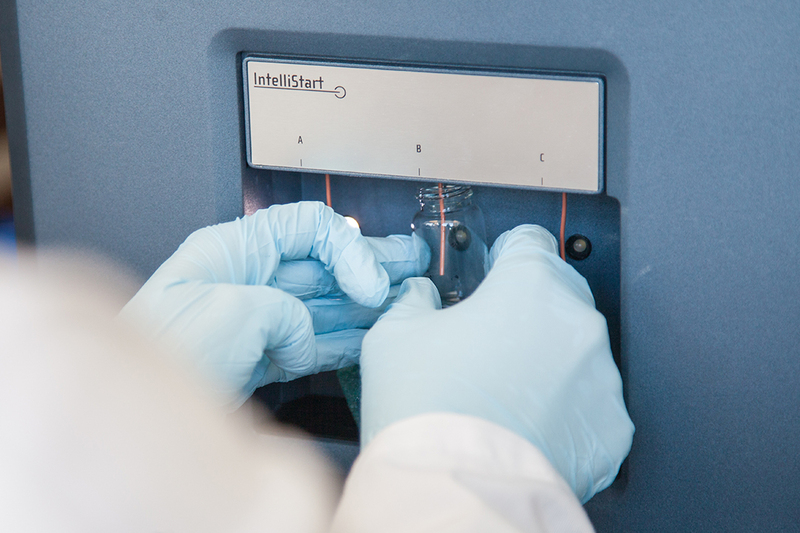 Specialising in microplate solutions for sample preparation to high throughput screening. The company had previously identified that commercially available deep well microplates can harbour significant levels of extractable compounds and that previous research showed that there was ongoing persistent contamination from a range of compounds found in raw polymer master batches. Staff from Swansea University developed a protocol for extracting contaminates into an organic solvent and its analysis by accurate mass GC-MS instrument. A mass spectrometry operator from a UK based university requested training on traditional probe techniques. The operator identified a number of areas that they needed to gain further technical knowledge and practical training. These included, calibration, how to adjust high resolution, the analysis of low volatile samples, and cleaning the crucibles and the probe. Staff from Swansea University worked with the operator develop a bespoke training package and delivered the training at the Facility over two-days on our Thermo Finnigan MAT95. We aim to provide a high-quality, cost-effective mass spectrometry service, specialising in the expert analysis of challenging samples for the chemical, pharmaceutical and life sciences sector. Swansea has long been established as a centre of excellence for mass spectrometry, with the siting of the Royal Society Research Unit in the 1970s followed by the Mass Spectrometry Research Unit and then the EPSRC National Mass Spectrometry Centre in the 1980s now the National Mass Spectrometry Facility (NMSF). Contact us using one of the methods below and we will get back to you.